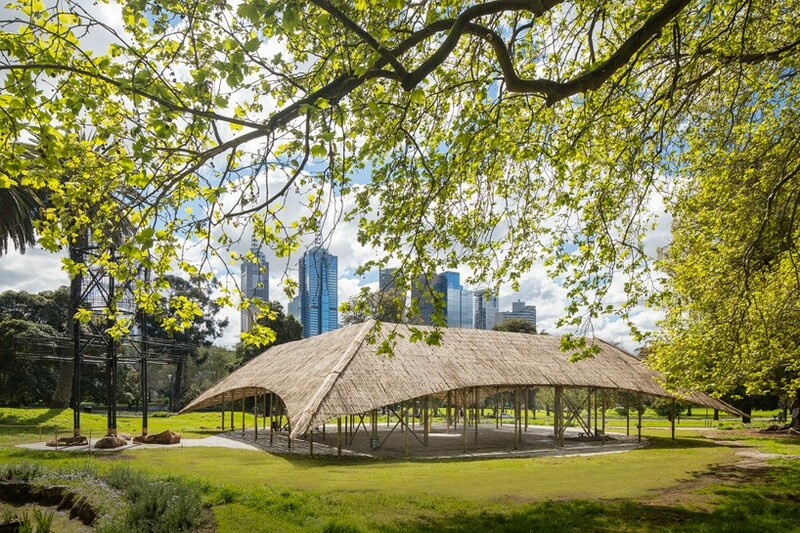 MPavilion is an event hub, meeting place, and temporary landmark for the australian city of melbourne. inspired by london's annual serpentine pavilion, the design of the structure is awarded each year to an acclaimed architect or designer. 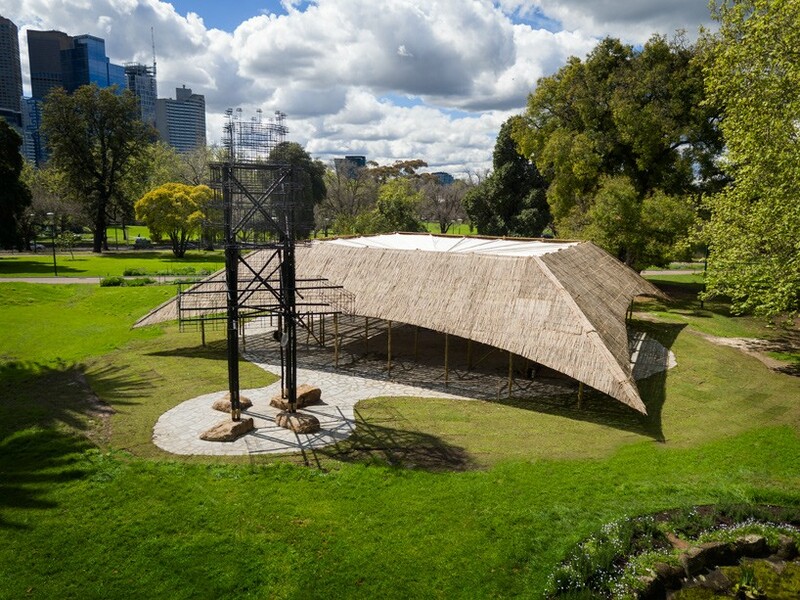 indian architect bijoy jain’s design for the 2016 MPavilion has been fully realized, with the sprawling bamboo structure now situated in melbourne’s queen victoria gardens. now in its third edition, the summer pavilion is commissioned annually by the naomi milgrom foundation, a not-for-profit organization that initiates and supports public design and architecture projects. UPDATE: on march 31, 2017, it was announced that the pavilion is to be gifted to the people of melbourne and will be relocated from its temporary site at the queen victoria gardens to its new home at the melbourne zoo in parkville. 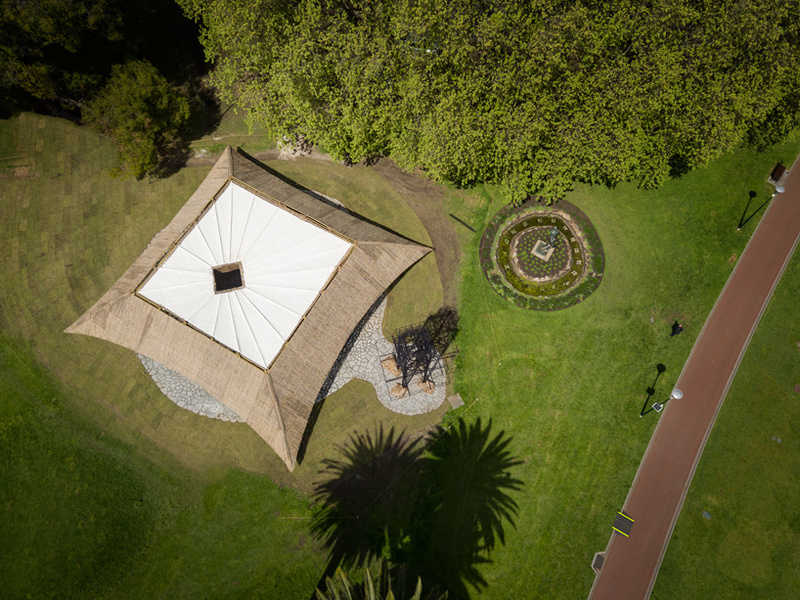 melbourne zoo director kevin tanner said the MPavilion would be incorporated into new landscaping in existing open space just off the main drive between the heritage carousel and the japanese garden. 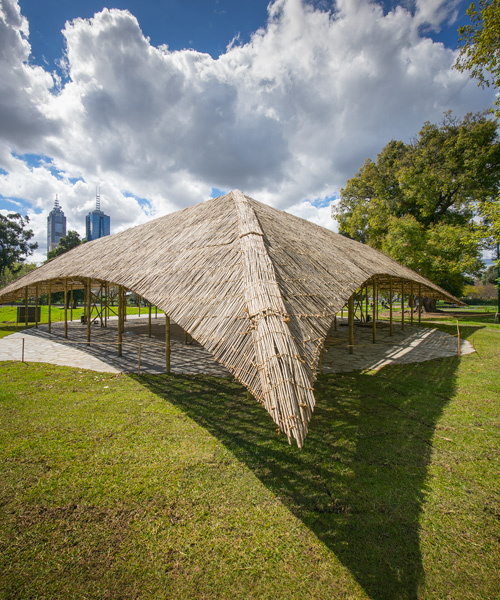 this year’s MPavilion is constructed from 7 kilometers of bamboo, 26 kilometers of rope, and 50 tonnes of stone. the end result sees a dynamic structure measuring 12 meters in height, with an earthen roof that pays homage to the australian landscape. the oversized canopy covers a space where programs, workshops, performances and installations will be hosted during its four-month residency in the park. an aperture at the center of the roof symbolizes the connection of the earth to the sky, while below sits a golden well that represents the importance of water to place and community. an elaborate ‘tazia’ entrance tower, commonly used in indian ceremonies, sits next to the pavilion as a welcoming gesture. the architectural response captures jain’s ongoing focus in addressing traditional craftsmanship and human connectedness. 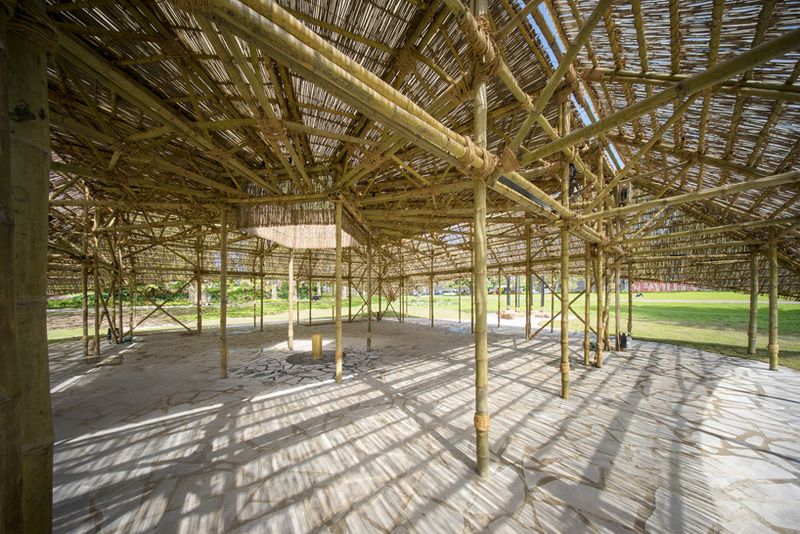 the pavilion is placed on a locally sourced bluestone floor, while the bamboo poles used for the underside were specially imported from india and connected with 5,000 wooden pegs and tied together with rope. furthermore, indian craftsmen wove together sticks from the ‘karvi plant’ during a four-month period to create the slatted panels seen on the roof. 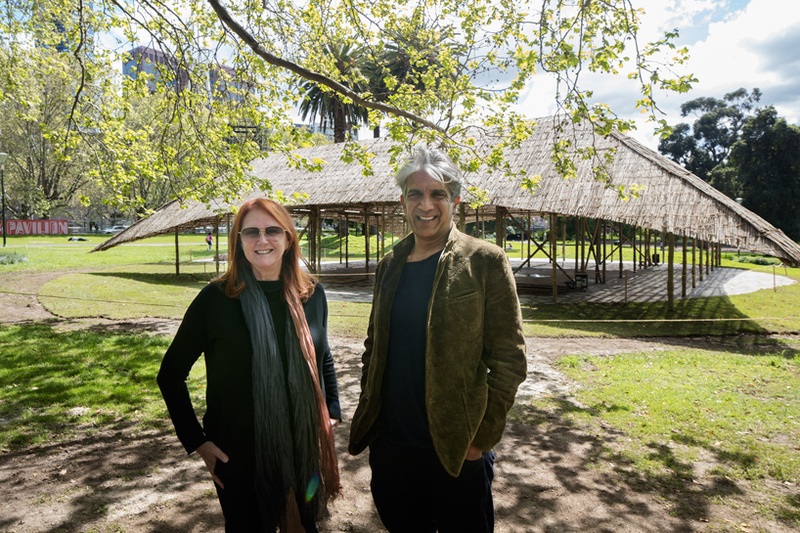 take a look at the 2015 structure — designed by amanda levete — and our previous coverage on the design development of bijoy jain’s pavilion here. It sure is a whole lot cooler than Calatrava’s “Occulump” in NYC. That structure is inspired by the roof of the bamboo Bengal hut with the two way slope and the curve of the ends- not Australian landscape!